View of Franklin Field from Penn Park. One of Philadelphia's less-discussed parks — and granted, there's a lot of competition — is the University of Pennsylvania's Penn Park at South 31st and Walnut Streets. Opened in 2011, the $46.5 million project merged a former parking into 24 acres of land running right up to the edge of the Schuylkill River. 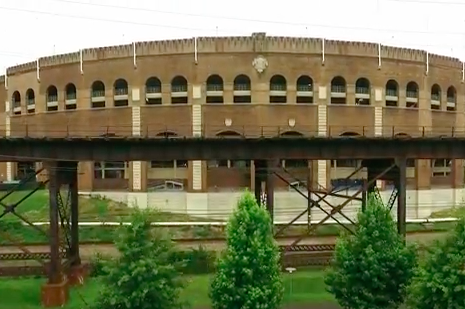 Primarily the site of athletics facilities, the park added 530 trees to West Philadelphia and offers two fields, a softball stadium with seating for 470 people, 18 tennis courts and a parking lot with 210 spaces for those coming in from out of town. Brian Cosgrove recently uploaded a montage of scenes at Penn Park captured by his new drone on its virgin flight. "Went ahead and made a mini-montage of footage from the first flight of my Phantom 3 Advanced drone," Cosgrove said. "Kept it in beginner mode so all shots are from less than 100ft up, but thought that the shots still turned out pretty well!" Check it out below. Maybe he'll become an expert and piece together a mega-montage of park views from around the city.